I am so excited to share this tutorial for DIY Under Bed Rolling Storage Drawers today. We have completely given the girls room a makeover. Their room is quite big, but with their two twin beds in there, it was a tight squeeze to get their dressers and vanities in there. So we decided to make them some large under bed storage drawers to use instead of a dresser. And I’m in love with them! My husband is really good at building things. And he is passing that knowledge on to my kids and I. So we usually do these projects together as a family. Although he did all the figuring and cutting, we learned how to use a biscuit joiner, the Kreg Jig, and the kids had fun learning how to use the drill and how to put things together so they will last! We made these drawers with a cut out for their hand to go through so pulling out the drawers will be easier. We also used a wider wood for the front of the drawers so they can’t get pushed all the way under the bed. Let’s start out with the wood we used and the measurements we used. **You will need to figure out the measurements yourselves because every bed sits at different heights from the floor. Here are some tips for measuring. Measure from the floor to the lowest part of the bed. 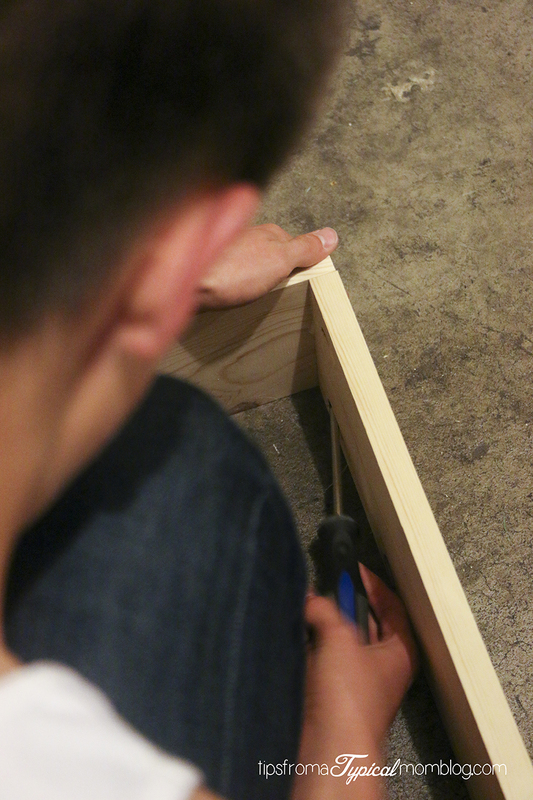 The final measurements of our drawers are: Front of the drawer: 37″- Side of the drawer: 24″ so that is the size we cut our plywood because the plywood gets screwed to the bottom of the drawer frame. *This post contains affiliate links, read my disclosure policy for more information. Start off by cutting your plywood into 4 rectangles sized 35 1/2″ x 24″. Cut a handle out of the 8 inch pine boards right in the middle as shown with a skill saw, or if you would like to use a drawer pull, do not cut this out. In the picture below you can see where we cut the biscuit holes and Kreg Jig holes. Board on the top is the 8″ wide board. The biscuit holes are cut into the ends (you can’t see them in the picture). And you can see the Kreg Jig Holes on each end. The 6″ x 35 1/2″ board on the bottom is done the same way. The boards on the sides are the 6″ x 24″ boards. They only have the biscuit holes cut on the top edge. Sand the boards until they are smooth. Put together the frames of the drawers by using wood glue, biscuits, and screws as shown. Screw on the plywood to the bottom of the drawer. Paint the drawers and let dry completely. Screw on the caster wheels, making sure to use screws that will not go through the plywood. Add drawer bumpers so when the kids close the drawers, they don’t slam against the bed. Enjoy the extra space in your rooms! « 25 Days of Christmas Movies! We so need this for our beds. And you made it so easy!! Can’t wait to do this myself.